Mohammad Mustafa has lived more than half of his seven years with a crippling, chronic bone infection that has made his left leg four inches shorter than his right. In his home of northern Iraq, Mohammad has already undergone 12 operations. The next treatment for him there would have been amputation of his leg starting at the hip. "We had lost hope," said Mohammad's father, through an interpreter. After so many surgeries and still the same, the little boy seemed to be headed for a life of disability. But due to a series of life altering circumstances, Mohammad will be given a second chance at a normal life and will soon be running with all of the other boys his age. Found by a missionary from the United States, Mohammad was introduced to Dr. Goodman Espy who was on a mission trip to Iraq. Overwhelmed by his smile and love of life, Dr. Espy was determined to get help for the little boy and began making phone calls. Later back in the states, Espy, an avid marathoner, had fallen and was being treated at Pinnacle Orthopaedics. His regular doctor was unavailable and he, instead was seen by William Terrell, MD. When he saw all the certificates on Dr. Terrell's wall noting his expertise in limb lengthening surgery, the light bulb went on. Espy asked for Dr. Terrell's help and arranged to provide x-rays and photos of Mohammad's leg. Mohammad and his father were brought to the United States to be seen by Dr. Terrell and the rest is history. Dr. Terrell met with Mohammad and his father after the exam to explain the difficult level of the surgery. "Much of his bone is missing and what he does have is infected from so many surgeries, but we feel we can lengthen his leg a couple of inches now, he will take a break for a year or so, and then we will bring him back for another round to add two more inches." Mohammed and his father will stay in the United States for about 9 months while he recovers. During this time he will go through an extensive physical therapy program. At this time, Mohammad has had the surgery and is progressing very well. He is actually ahead of schedule! "I am not the hero," says Dr. Terrell. "I am just a technician." 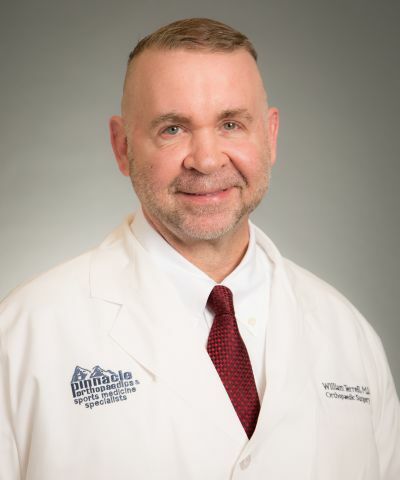 William Terrell, MD is one of only 15 physicians in the United States who are trained in limb lengthening and reconstruction, specifically the llizarov Technique, which was created in the former Soviet Union. Dr. Terrell has been performing the surgeries since 1997 and is now teaching other physicians the intricacies of the work. "I am not the hero," says Dr. Terrell. "God is the hero, I am just a technician."